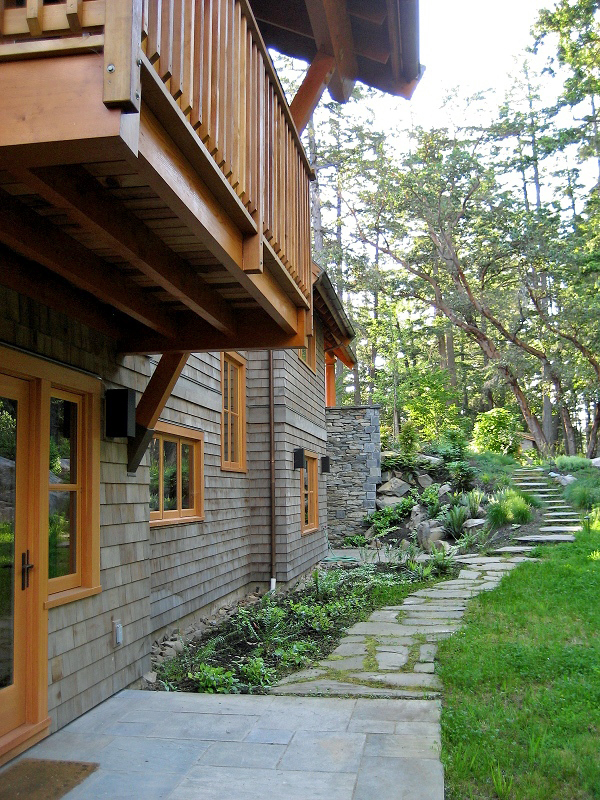 This 2½ storey 6000 sq/ft home is located on high-bank waterfront overlooking Ganges Harbour on Salt Spring Island. The owner’s primary focus was to create a vacation home and family gathering place for his children and grandchildren. The program called for a melding of a traditional English Cotswold home with the modern aesthetic of Pacific Northwest style. The steeply pitched slate roofs, dormer windows, and massive stone fireplace all evoke tradition, while the large windows, open plan, and clean lines lend a more modern element. Interior rooms blend seamlessly with the flagstone patios and pathways of the exterior gardens. This home was awarded the Best Single Family Custom Home and the People’s Choice Award by the Canadian Homebuilders in 2007, and has been published in Aqua Magazine, the Times Colonist and, the Vancouver Sun.